In a few weeks, it will be a lot more difficult to get a credit card if you’re under the age of 21, at least, that’s the plan. The Credit Card Accountability, Responsibility, and Disclosure (CARD) Act of 2009 (Credit Card Bill of Rights) will go into effect on February 22nd, and bring with it a number of changes, which I previously wrote about. But another issue at hand is extending credit to so-called underage consumers, specifically those under the tender age of 21. While these individuals may consider themselves full blown adults, credit card companies will soon be required to treat them differently than the rest of the population. The impending legislation will require that those under 21 who apply for a credit card either get a co-signer aged 21 or over, or document the ability to repay the credit card debt. If the under-21 applicant chooses option one, that co-signer will be on the hook for any unpaid debt; if they choose to document income, it’ll probably be rather cumbersome, and certainly not the instant approval we’ve all grown so fond of. For example, you may be required to mail in tax returns, pay stubs, provide a CPA letter, etc. Additionally, if under 21, a credit line increase will only be permitted on a joint account with the co-signer’s permission. Or again with income documentation. In other words, kids can’t go increasing their card limit without their parent’s knowledge. So it’s going to be more difficult to get a credit card if you’re under 21, which in one respect, will be a good thing. But what about those who need the credit, are generally responsible, but unable to get a co-signer or document income? Will it lead to an increase in the use of prepaid credit cards, or an increase in personal loans, both of which have much less favorable terms than credit cards? I hope all the implications have been considered for the sweeping changes, especially since credit cards are often a young consumer’s initial credit building tool (how to build credit). Tip: For the record, you need to be at least 18 to apply for a credit card on your own. And if you’re aged between 18 and 21, all income listed on the credit card application generally must be your own. If you’re over 21, you may use a spouse or partner’s income to qualify for a credit card. 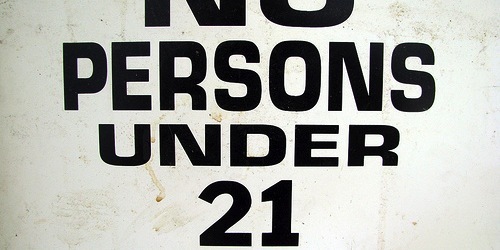 The easiest way to get a credit card if you’re under 21 is by becoming an authorized user. So if you have a parent or guardian or even older spouse that is 21 or older, they can make you an authorized user on one of their existing credit card accounts. The downside is that you will only get to become a cardholder on whatever account they have opened, so you won’t get to choose a specific credit card (unless you ask them to apply for it). However, this is a great way to build your credit until you turn 21, and will make it that much easier to get approved for subsequent credit cards once you finally turn 21. Just note that the parent/guardian/spouse that grants you access will be liable for your debt, so this is a privilege that must be taken very seriously. Assuming you don’t have a co-signer (such as a parent) and you don’t have enough income of your own to get a credit card, you might be able to apply for a secured credit card instead. A secured card relies on collateral, such as an associated bank account, to ensure you have the funds to use your credit card. However, this is really only worthwhile if the credit card builds credit history. Otherwise it’s just a quasi-debit card. Alternatively, just use a debit card until you turn 21 and then apply for a credit card. It might be the smarter move, especially if you don’t have the necessary income in case you get in over your head. Credit is a privilege and one that comes with great responsibility. So tread cautiously. Read more: Student credit cards. Next Next post: Does My Spouse’s Credit Affect Mine?